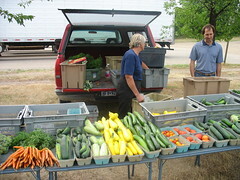 The Northfield Farmer’s Market is in full swing as Summer reaches its middle. New this year is a Monday evening market on Highway 3, in the South Gate Cinema parking lot. Farmer’s Markets are a great way to buy local food grown in the community and surrounding areas, and to support local farmers. Saturdays 9am-11am at Riverside Park as well.